Following its appearance at darc room, David Morgan takes a closer look at formalighting’s extensive Motolux range of motorised architectural lighting products. When a lighting company started by two Italian brothers in London in the 1960s grows into an international business with headquarters in Milan and Hong Kong, sales offices in New York, London and Shanghai, it seems certain that the company will also have a highly adventurous approach to product development. formalighting was founded in the UK by brothers Guido & Lorenzo Maghnagi as a distributor for a number of Italian lighting brands, including iGuzzini. The Maghnagi brothers chose to open their showroom in the Business Design Centre in Islington. Working with leading Italian designers, the company then started to develop its own architectural lighting products. Lorenzo moved to Hong Kong and established one of the first European-owned lighting factories in China to manufacture these ranges. The combination of Italian design flair with the lower manufacturing costs available in China has allowed the company to expand steadily over 50 years and it now employs more than 180 staff worldwide. When I first met Lorenzo in the 1970s, I would not have predicted that formalighting would become the kind of company to create an impressive range of motorised architectural lighting products, but that is precisely what they have achieved. The benefits of being able to aim and focus projector luminaires without the need for cherry pickers, scaffolds or ladders have become more obvious due to increasing health and safety at work legislation. These requirements have dramatically increased the costs of manual aiming in larger spaces. Conversely, the production costs of remote-controlled luminaires have fallen as the various enabling digital technologies develop, which in turn has widened the market opportunity. Looking specifically at formalighting’s Motolux range, it initially started as a collaboration with an American engineer who had an existing patent for a fairly simple form of motorised lighting, although the history of motorised and remote-controlled lighting dates back to a much earlier period in the 1920s. Technical pioneers, including Herbert F King from Massachusetts, first filed a patent for a fiendishly complicated mechanism with separate control of pan and tilt, all driven by electric motors, which would allow products on display in shop windows to be individually lit in sequence. A little later in 1929, Charles Andreino from Canada patented a similarly complex remote-controlled, motorised spotlight system that included focus control. The first, and fairly limited, product introduction of the Motolux range was at Light + Building in 2016, which resulted in a new patent for the motorised multi-axis gimbal rings. The initial range was well received and the formalighting development team spent the next two years leading up to this year’s Light + Building show creating an impressive twelve different product families incorporating the technology. These families include individual recessed downlights, multiple recessed projectors, track mounted projectors, pendants and surface mounted luminaires, as well as some exterior IP-rated versions of these types. In many cases the remote-controlled versions are based on the original, manually aimed, luminaires, which are still available for simpler projects. The Motolux range is so extensive that there is not enough space in this review to discuss any particular luminaire in detail. If I was to choose one of my favourite products I would opt for the Moto Ola, a minimal pendant gimbal with motor control suspended on two slender power cables. The Moto Ola can be fitted with a Soraa Snap light engine so that all the Soraa snap accessories can be attached magnetically. The head can be rotated in both axes although at this point, as far as I know, the suspension cable length is not remotely controlled. However cable length control is available, if required, with the rather larger Moto Roulette pendant. The smallest track mounted spotlight in the range is the Moto Zero 40 Compasso, which is only 40mm in diameter. 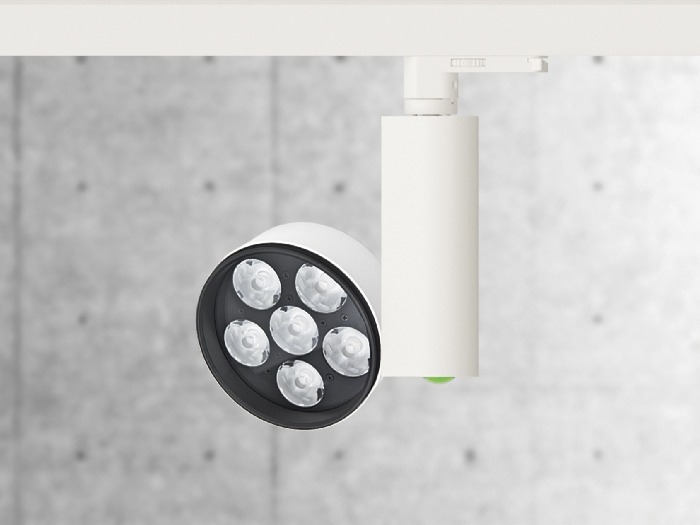 The mechanisms incorporated within the various luminaires are highly miniaturised, and have been cleverly designed so if the luminaire body is rotated manually, no mechanical damage is caused and automatically resets to the start position when powered up. The Motolux range introduced this year includes a very wide variety of light engine options and complementary technologies which supplement and compliment the motorised control. Mechanical focusing is available as one option but other versions incorporate the LensVector liquid crystal solid state focusing system, which I reviewed in arc 104. 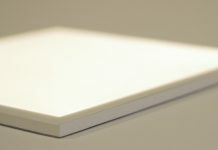 One of the advantages of incorporating Lens Vector is that the luminaire size is reduced to that of a non-focusing product. Apparently, formalighting was one of the first companies to develop luminaire designs incorporating the early LensVector technology. A dedicated Motolux hand transmitter is available that enables all the functions to be individually controlled for each luminaire, but there are also versions incorporating Casambi wireless control. When a luminaire is selected for control either by the hand transmitter or via Casambi, a green indicator LED lights. The variety of light engines available includes tuneable white, dim to warm and colour changing. The remarkable full spectrum Lumenetix LED module, providing both tuneable white and colour changing, can also be incorporated in the range complete with Casambi control, which is another first for formalighting. formalighting has created a well-designed and very comprehensive range of remote-controlled luminaires that can be used in a wide variety of architectural and retail lighting applications. Their ambition to push the boundaries of product development has set them on a clear trajectory to increase the overall market size and their share of this market segment.